I headed over the hills with Graeme to the home of steel in search of more urban browns, these industrial power houses had to be somewhere and we would not be disappointed. The weather was warm and we expected early rain but in the shadows of derelict mills we kept pretty cool. Our dull green clothing would probably be more ideal camouflage in wooded areas than the cold stone walls around us. We spotted a few browns as we headed down river, the river was clear and very low and with no cover stealth would be a real issue. However stealth would also be our saving grace. Opting for similar techniques, Graeme with a foam indicator with a weightless nymph while myself using a weightless bendles bug 'under' a Klinkhammer (if it decided to sink). We would use long range casting to prevent the fish from spooking from our presence and with no splash on impact other than our fly line, surface movement was kept to a minimum. 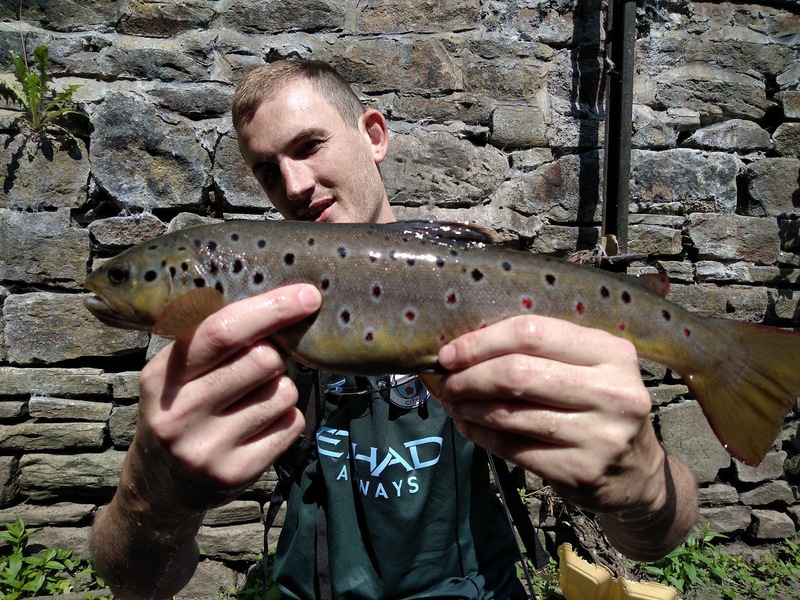 Being an experienced urban fisherman you learn the attitudes of fish in these locations. 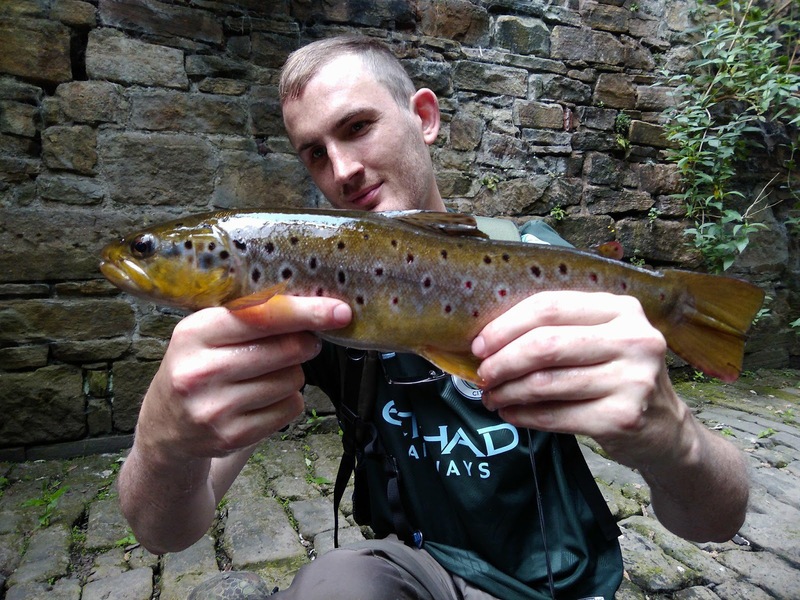 We went through a couple of fishy runs and i missed a lone fish, we had seen plenty of juvenile fish which was very positive and unusual in these vastly urban environments due to lack of spawning gravel and constant pollution. Graeme would lead and up ahead lay a riffle section created by a pile of rubbish in the flow. Graeme cast in to the bottom of this run and nothing but we both agreed that 2 feet upstream of that cast should be a fish, and we was right. In these locations you have very little room to work the fish so the best tactic is to, if possible, keep it downstream thus not spooking any fish further up. This fish wouldn't pass the shallow section of the rubbish so was quite controllable despite the fight it gave, however the fish later on would be much more difficult. In the next run i had to deal with very still water but the light gear we was using was the only way to go and it came up trumps. 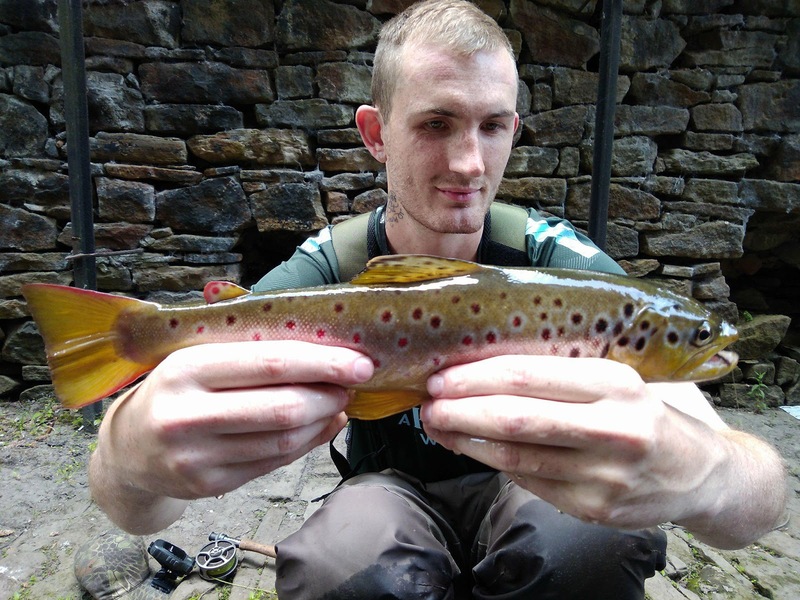 My nymph was barely sinking but once it was wet it slowly sank and within minutes i was into a fish. Mine was slightly smaller than Graemes but it gave a good fight, holding the rod high above my head to prevent it going under any undercuts in the channels it definitely gave the arm a work out. We would work our way up slowly and would be catching fish in similar fashion, some would wait for the nymph to sink fully and some would take the nymph just as it landed. Fishing under trees it would imitate a bug falling from the tree as there were very few areas bugs hide under the surface to to a lack of rocks. The fish were also rising at certain points and with barely any fly life it must of been purely on bugs from the trees. We had some pretty funny moments, i had a fish swirl under my klinkhammer twice, millimetres from it's face while seconds later one took Graemes foam indicator while another took his nymph at the same time. The sound of their mouths 'clapping' the surface as they closed their mouth around whatever they were taking was more enjoyable when i got my first one on the dry of the day. Klink and dink method isn't ideal when you need to change depth but it gives you that double coverage on fish that are both feeding below and on the surface and having used this technique before on Arthurs club waters on much smaller fish i knew it was a tactic that worked. The fish we were catching were all very pretty but the ones with the big red spots really stood out to us. Being the most colourful thing around other than a brave kingfisher that might frequent this place it always surprised me. It bares no advantage to their camouflage but must mean something to the trout, the dark backs were good enough camouflage alone especially in the shaded waters. We observed plenty of schooling and outmuscling of this, usualyy 2 'big' trout with a dozen or so smaller trout down to a couple of ounces. If one would move out of line the bigger ones would swim along side it and, basically, side swipe it which also happened if we had a fish on and it swam past non-spooked fish. In all we had 20 fish between us of good size and plenty of juvenile fish to boot, this place if kept protected has a future but like most urban stretches it is always at risk from humans via poaching and pollution. Is the Irwell making a comeback?